"Brian and team at Montana Angler exceeded my groups expectations from the first email contact on through the entire trip. They were prompt, helpful and knowledgeable. The guides were outstanding and ensured our group of novices had the right blend of instruction and fun. I would recommend Montana Angler without reservation to anyone." "For our first crack at fly fishing we employed the services of Montana Angler and we felt very fortunate to have Brian McGeehan and his guides managing our trip. They were all very informed, highly experienced, and quite patient with us, as we learned technique and practiced our casting and presentation skills right on the water. We floated two different rivers over two days and enjoyed a terrific trip as Brian and his cohorts were very knowledgeable about the water as well as the surroundings. We caught a lot of fish and also learned a great deal more about Montana beyond fly fishing. If you are beginners, like my group, or experienced at fly fishing I highly recommend giving Montana Angler an opportunity to provide you with an exciting and memorable trip on some of the most beautiful waters in the country!" "Thanks again for a wonderful experience on our recent fly fishing trip to Montana (6/11-15/12). Everything from start to finish was near perfect. We're all beginner fly fisherman and for some in the group this was to be the first time, so I was a bit anxious about putting together the right trip for everyone. Expectation were high. I'm glad to say Montana Anglers hit the mark and went well beyond. Miles was great to work with on the planning because of his knowledge of the area, his understanding of the best fishing opportunities given our experience level & interests, and the options available for lodging. He listened well to our requirements and did a perfect job matching our needs with what he knew would be the best possible experience in every category." "Let me first start with Grey Cliffs Ranch. With 5,000 acres near the Lower Madison, it is nothing short of an amazing property. 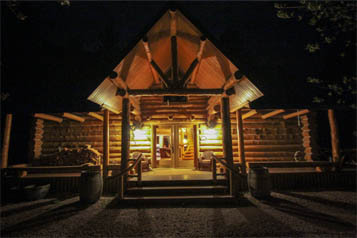 The 8,000 sq ft lodge is 5-star. Very upscale in every way. The ranch was a great location for the fishing we did. So much to do on the ranch itself including fishing in the private trout ponds, shooting sporting clays at the range, riding horses, taking the jeep around the property, or just kicking back with a cocktail or glass of wine on the deck as we enjoyed the scenery. We all commented how we could have used another day to enjoy more of what the ranch had to offer. Chris the property manager and Mike the chef were very attentive to everyone in the group, available at any time and accommodating in every way. The food was incredible and Mike did a fantastic job adjusting the menu according to our requests. Both were very engaging, but knew when it was time to leave us be to enjoy each others company. They delivered the perfect balance of service, privacy and consideration." "All of us thoroughly enjoyed our time with our fishing guides Miles & Matt. It was clear this was not their first rodeo. They not only showed up with an idea of where we'd be fishing to maximize our time and interests, but also a game plan to help us progress through various fishing & casting methods that culminated with dry flies on the Firehole River in Yellowstone. Having been out with other guides in MT before, Miles and Matt clearly are in a class above the rest. They are professional, personable and prepared. We were looking for a learning experience and certainly got one, but most importantly, they put us on fish. They were both very patient, letting each of us learn at our own pace. They each have exceptional knowledge, impressive fishing abilities, a calm demeanor and good communication skills. One of them would always seem to show up, make a suggestion or change our rig right at the start of any frustration or problem. They had very good equipment & tackle, and were always focused on making sure we each had the best possible configuration at any given time. I know Matt & Miles are both in high demand. We will plan our next trip accordingly so we can work with them again." "Finally, my thanks to you and the rest of your team. I appreciate your personal assistance with some of the finer details both before and during the trip. It was great to know your help was a phone call away. You run a great operation. We will spread the word in MN about the benefits of booking with Montana Anglers. Thank you for making this a bucket list trip! We'll be back soon. Fish On! " "Brian, just wanted to let you know how much I enjoyed the recent trip our group took to the Boulder River Outpost. Matt and Bill really did an excellent job of guiding us on the waters that we fished. They both were very professional and knowledgeable and just fun to fish with. Simon was amazing as the camp cook. He made our stay at the cabins very comfortable and interesting. The whole crew did an excellent job while we were there. I would highly recommend the Outpost to anyone and look forward to returning again." "Brian, Chris and I really appreciate the day we spent with you on the Madison. The day would have been a disaster without you. We were impressed with the manner in which you conducted the entire trip, making it a productive, fun and safe day on the water. Thanks very much from a couple of guys in North Carolina." "Myself and my wife have just enjoyed a fantastic day's sport with Montana Angler in the company of senior guide Matt Morris. My wife had never cast a line before, but Matt soon had her into the action with his calm encouragement. Very quickly she was enjoying that special moment of tightening into a wild brown that has just flashed at a dry fly. Thanks Matt. A special thanks also to the boss, Brian McGeehan with whom I had made the initial inquiry. He made every effort to ensure we got the best trip tailored to our individual requirements and I would have no hesitation in recommending his services for guided fishing in spectacular surroundings." "We had a great time this weekend. Would definitely consider it again and recommend the experience and your group to others. Your guys were very patient and never made us first timers feel pressured or hurried. No matter how many fly's we lost, lines we tangled or fish we didn't land, they were supportive, patient and appropriate. Overall, great weekend." "Thanks for a “gem” of a day on the Ruby River. My dad was having some trouble wading swifter water so you took him and my brother Jim to the tail waters just below the dam in a hole that gets a lot of pressure and the fish are very wise to the usual patterns. Thanks to your help, they both hooked up on big fish with my dad landing a 22” brown in only his second fly fishing trip. Miles took me and my brother Sam downstream and I was very intimidated by the swift currents but Miles knew the stream very well and by mid afternoon we had landed a dozen with the smallest in the 16” range. We couldn’t have done it without you, thanks!" "Got back into Pa yesterday. Had a great trip and built some great memories.The fishing during the trip was great. Having mostly fished the east, with only an occasional trip out west, It is always amazing to fish some of the fabled rivers out there. I have always wanted to fish the Firehole and the Gallatin, and the day your guide, Doug, took us out there was fantastic. Doug was a very easy person to spend time with. I've been with some guides who acted like it was a job and I was a customer. Doug acted like it was a day out with his friends, and he was doing what he wanted to do." "We had a wonderful time. The fishing was great and we loved the guides Kevin & Tony. Both were very knowledgeable and nice. Great match for our personalities. Elk Crossing was much more than we expected. We LOVED all aspects of this great cabin. Definitely would highly recommend you, your guide services and the lodging. This was a dream vacation:)"
"Just a note to thank you for the great fishing trip. It was a real pleasure to learn the ropes of fly fishing from such a seasoned fisherman. I had a great time, we caught some great looking fish and saw some beautiful scenery. We'll see you again soon... Best of Luck." "From the moment we arrived, we were greeted by Adam who is such a gracious host and a blast to be around. He was so accommodating and a truly genuine person. He made it easy to relax and soak in the Montana experience from the very first minute. The beauty of Montana is mind blowing! It's an experience I'll never forget and one that I look forward to every year by starting a annual tradition. I found myself wishing we had more days in the trip after getting lost in nature that was breath taking! Our guide Jared was not only professional and very experienced, but his patience in teaching two "newbies" in fly fishing and making us feel so comfortable was greatly appreciated. The stories and conversations around meals and downtime was just as much fun as was the scenic streams, creeks, and lake that we fished. Two days of fishing and 3 completely different fishing experiences. All the while enjoying the breath taking beauty of Montana. Thank you Brian for such an amazing trip and allowing us to create an experience that will never be forgotten! Please let know how much we appreciate Adam and Jared for all they did." "Once again, Fran and I want to thank you for the amazing service you offer on our visit to Montana. Initially, with multiple days to fish the area on our calendar, we fully anticipated the use of multiple guides to be able to cover the different fishing scenarios we had in mind. After the first day of fishing with you….we had an immediate change of mind and thoroughly enjoyed every minute of every day we fished in all of the various locations both wade and float fishing. I can assure you that we now always have one piece of advice when asked about fishing Montana… FISH WITH BRIAN MCGEEHAN & MONTANA ANGLER…and never be disappointed! Again…thanks a million for all of your hard work and shared knowledge during our very rewarding visit."